Storing Holiday Inventory | A.B. Richards, Inc. This is where portable storage containers from A.B. Richards, the leading supplier of ground-level storage containers in the Northeast since 1982, can help them. One or more of our secure, weatherproof and fireproof on-site storage containers can quickly, easily and efficiently be delivered on premises to retailers seeking a cost-effective short- or long-term storage solution for their seasonal and holiday stock. Retailers can choose 20ft, 40ft and 40ft jumbo (hi-cube) portable storage units that can be easily and affordably rented or leased. A.B. Richards’ 20ft container is particularly cost-effective for retailers and can be obtained for as little $79 per month, which is significantly less than any off-site storage location. One phone call to A.B. Richards at (800) 597-5971 and our expert staff can assess your store’s storage needs and pair you with the right portable storage solution for your retail business and your budget. Portable storage containers can hold everything a retailer needs before, during and after the busy holiday season: fixtures, signage, seasonal decorations, and high-demand holiday merchandise. All of these things are needed during October through December but can crowd an already busy sales floor in the off months. Mobile storage units free up all-important storage space in stock rooms that can become cramped and disorganized during the holiday season. Because of the mobile nature of these storage units, retailers can conveniently move excess inventory into one or more portable storage units right on site and promptly implement and handily maintain a retail inventory management system to track all inventory that’s stored. Using portable storage removes the cost of and need for expensive off-site commercial storage and warehouse space and related transportation costs. 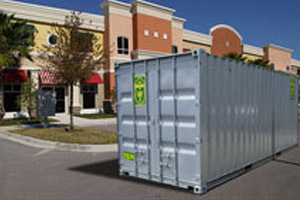 Renting or leasing on-demand storage containers can also help retailers throughout the year. They can store occasional-use items such as outdoor furniture and promotional displays and materials. They can also store crucial business records that need to be kept without taking up precious back-office space. Contact A.B. Richards today to learn more about our storage container renting and leasing options. A.B. Richards has 30 years of experience in the temporary storage business, and our trained technical staff handles all aspects of storage container leasing, including unit preparation and inspection. Our qualified delivery staff provides courteous and professional deliveries, and they ensure all of our containers are delivered to our retail customers – and to every customer – clean, painted and ready to use.